JAKARTA (Reuters) - A former Indonesian education minister backed by the main opposition party has quietly made gains in the race to become the capital's governor by courting disaffected Muslim voters while acrimony over a blasphemy trial occupies his rivals. 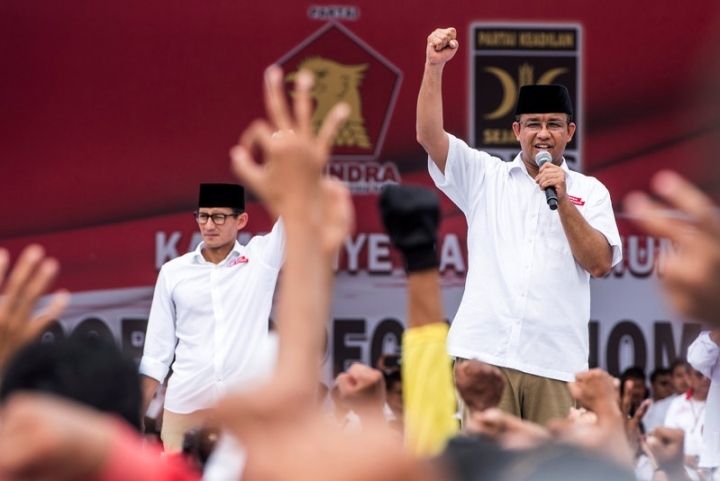 Anies Baswedan poses a late but serious challenge in Wednesday's vote for governor of Jakarta, a post that can be a stepping stone to the presidency of a country with the world's largest Muslim population. Campaigning for the election has raised the sensitive issue of religion in the politics of a country with a state ideology that enshrines religious diversity in an officially secular system. Officials from the Gerindra party backing Baswedan dismiss any suggestion he has played a religious card, while acknowledging he has appealed to voters, who happen to be Muslim, in slums where the incumbent, Basuki Tjahaja Purnama, has raised anger with forced evictions to combat flooding. "Anies has made sure he heard the voices of the victims of forced evictions who were mainly Muslim," said Arif Poyuono, a senior Gerindra official, referring to Baswedan by his first name. Baswedan's popularity has spiked since the head of the party, Prabowo Subianto, who narrowly lost the 2014 presidential election, started campaigning on his behalf, promising a comeback to the national stage in 2019, Poyuono said. The Jakarta poll is being widely seen as a proxy battle for the 2019 presidential election. Purnama, Jakarta's first ethnic Chinese and Christian governor, has won credit for cutting red tape and improving the performance of the bureaucracy. He has the backing of President Joko Widodo's party, and is standing again. The third contender is Agus Yudhoyono, the son of former President Susilo Bambang Yudhoyono. But the election has been overshadowed by Purnama's trial on blasphemy charges stemming from an accusation that he insulted the Koran in comments about how people vote. Purnama, known by the nickname Ahok, denies insulting the Koran but the accusation has provided common ground for Widodo's opponents and Islamist political forces, who have staged massive rallies against him. Former President Yudhoyono and his son have rejected claims that they or their family supported the protests. Though largely staying out of the fray, Baswedan has also turned to religion in the hope of winning votes and some analysts warn that his tactic risks fanning greater intolerance. "With Ahok arguably commanding the so-called pluralist vote, Anies' campaign team and political backers clearly made a decision to focus on the Muslim vote at a time when such identities have become increasingly polarized and politicized," said Ian Wilson, a lecturer at Australia's Murdoch University. Analysts attribute Baswedan's popularity partly to his strong performances in televised debates, as well as efforts to appeal to more conservative Muslims. Baswedan on Saturday made an appearance at Jakarta's grand mosque, Istiqlal, where religious leaders urged thousands of people attending prayers to elect a Muslim leader. Baswedan, a respected academic who won a Fulbright scholarship to study in the United States, served as Widodo's speechwriter during his 2014 presidential campaign before becoming minister for education and culture. He was removed from the cabinet in a reshuffle last year. He has pledged to improve public education, contain living costs and end forced evictions. After lagging his rivals for months, recent polls put Baswedan in second place, just behind Purnama. Wednesday's election is widely expected to go to a second round in May if no candidate wins an outright majority.